Disclosure: This post was made in partnership with California Almonds. Thank you for supporting the growth of Food Heaven! Have you ever left your workout feeling like you’re on top of the world…and then those hunger pangs start kicking in? Your stomach is still doing jumping jacks, you feel light headed, and you’re ready to eat everything in sight. Yeah, we know that feeling. Which is why we’re bringing you this article on 6 balanced snacks you can eat after your workout session! When thinking about post-workout snacks, aim for a balance of protein and carbohydrates. You want to repair those muscles, while also getting a boost of quick energy into your system. For those of you wondering, well how often should I be working out? We generally recommend about 150 minutes of moderate cardio per week and 2 days of strength training. Cardio would be things like running, zumba, and dance, while strength training would be any weight lifting, working with resistance bands, or squats. We understand that life gets in the way though, and so it’s important to set realistic goals when thinking about exercise. It’s also important that you to find activities that you love and find pleasure in doing. Try out a variety of different exercises, classes, videos, or activities and find what speaks to you most! Alright, ready to workout? Let’s talk about what you’ll be fueling up with once you’re done. Before you start working out, take 5 minutes to blend up some fruit, almonds, and your favorite liquid base. 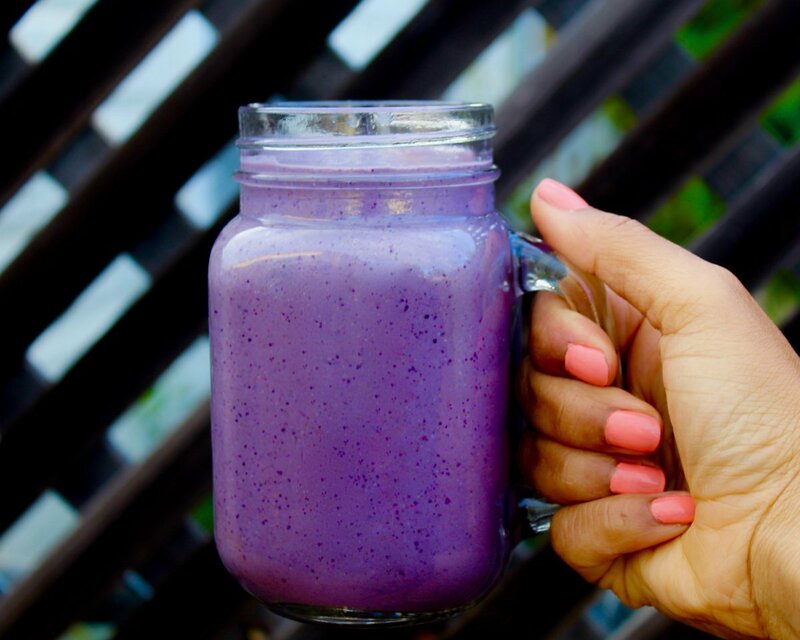 Aim to prepare the smoothie right before you workout, so it’s not sitting out for too long. I typically prepare mine with 1 cup of frozen berries, ¼ cup of almonds, and use 2 cups of soy milk as my liquid base. This is one of my favorite post-workout snacks because it provides a great balance of protein, fat, and carbohydrate. Sometimes I may add chia seeds or flax seeds for additional fiber and protein! These wraps take a few minutes to whip up, and you can incorporate them as part of your meal prep routine. 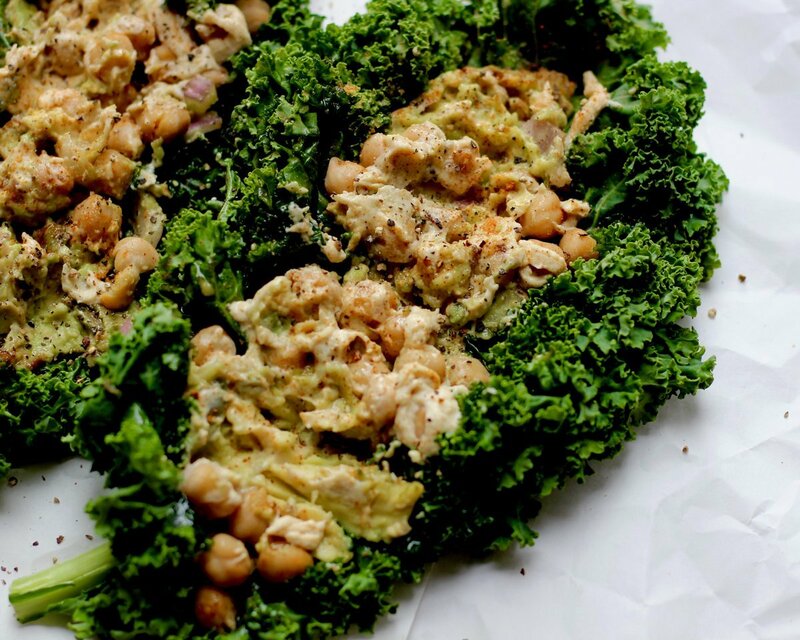 Grab 2 large kale leaves, and stuff them with 2 ounces of tuna and ¼ cup of hummus or ¼ cup of your favorite beans. Season with your favorite spices and enjoy! Kale is packed with vitamins A, C, and K and is also a great source of iron, folate, B vitamins, calcium, manganese, and fiber. Consumption of dark, leafy greens (like kale) has also been shown to lower the risk of cardiovascular disease due to its high antioxidant content and anti-inflammatory function. Enjoying your greens in between meals is a great way to meet the recommended 3 cups of vegetables per day. This parfait takes less than 5 minutes to prepare, and to make your life easier, you can do all the pre-rinsing and chopping at the start of your week to save time. 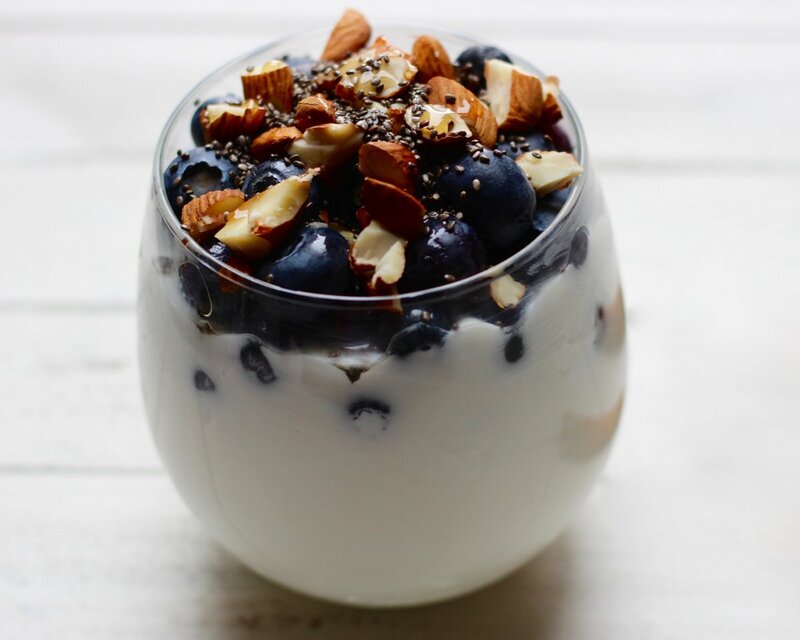 Add 1 cup of plain Greek yogurt to a to-go cup, and layer with ½ cup of blueberries, ¼ cup of chopped almonds, chia seeds, and a drizzle of maple syrup. 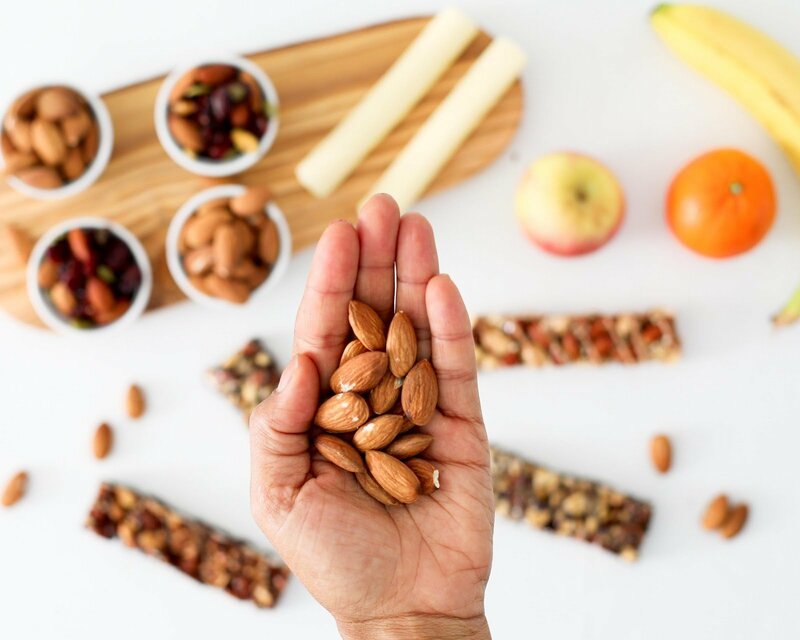 The almonds alone in this nutrient-packed snack packs 6 grams of protein and 4 grams of fiber! Hummus is a delicious way to pack in that protein and fiber after your workout. You can either purchase pre-made hummus or make your own! If you decide to whip it up yourself, the best part is that you can get creative with how you make it. 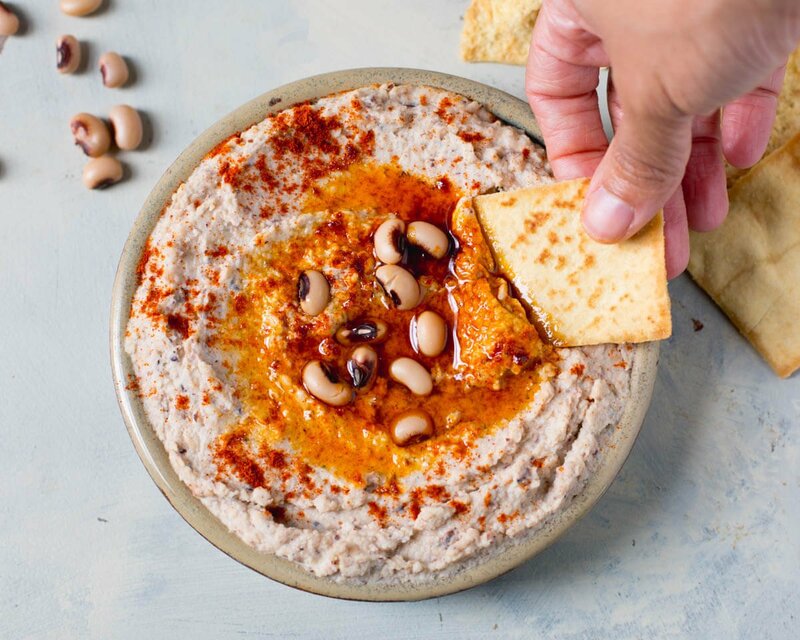 One of our favorite renditions is this black eyed pea hummus. Simply blend the black eyed peas, tahini, lemon juice, garlic, water, and olive oil until smooth. Add your favorite spices and enjoy with pita chips! This is a really fun and quick snack that you can pack up and enjoy with a spoon. 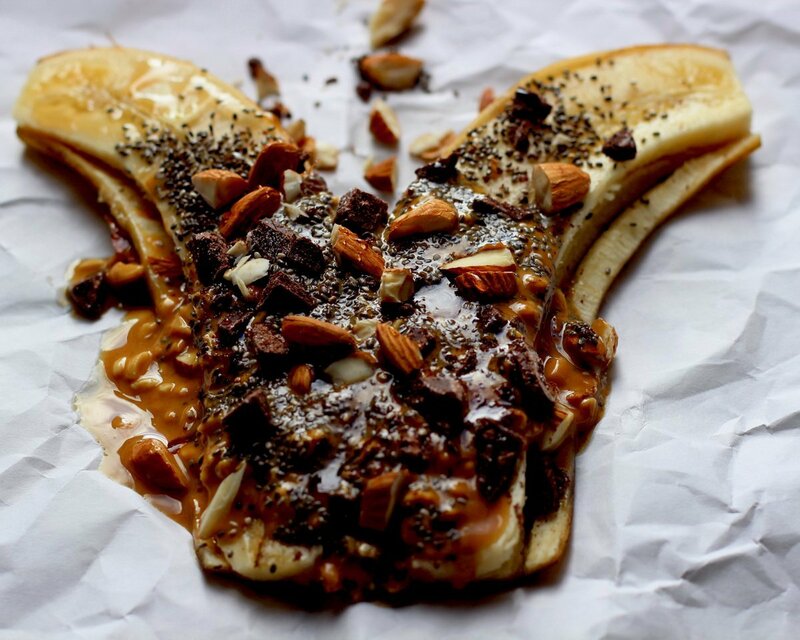 Simply slice a banana, and add dark chocolate chunks, chopped almonds, almond butter, and chia seeds! It’s perfect for those of you who have a sweet tooth, but don’t want that sugar crash a couple hours later. Dark chocolate is rich in polyphenols, flavanols, catechins, and other powerful antioxidants. Some studies have even shown that the flavanols in dark chocolate can improve circulation and may help with blood pressure control. Feel free to customize with your favorite fruit!